I'd rather keep the stock radio on shelf, untouched then do that. Eh, I think it's pretty slick. Retains appearance and functionality of the original and gives you modern capabilities. I'll think about doing it. I have Amazon prime(order is prime ready) and I ordered them this afternoon around 2PM. Somehow Amazon thinks it'll be here next Thursday. So, a total of 4 business days not counting(because it's later in the day) today? I'll look forward to your appraisal of them. I know these things are supposed to float, but damn. Yeah my front shocks are leaking and it came with load assist shocks in the rear. Rear end bounces over everything while the front is like a speed boat over waves, only less rough. I'm slowly working on removing the old ones. Due to rust, I ended up cutting the bolt that holds the rear shocks in on the axle. The top where it's got a nut on top.... I will shoot the engineer who thought that was enough space. There's room for a ratcheting wrench. Or, if you have access to a lift, I'd imagine it would be easier. The old shocks, if you try and loosen the top nut, the shaft rotates. I tried grabbing the top of shock since the stud has a squared off head, no enough room to grip the top wrench while turning the nut with the ratcheting wrench. I had some luck but, once the rust built up on the threads from turning the nut, the wrench holding the sock stud from spinning stripped. Out of frustration, I sawzawed the shock in half so that just the shaft remained and the oil revisor was intact and the stupid load assist spring was out of the way, leaving room to grip the shock shaft with a pair of channel locks. The saga will continue. I ran out of time and had to pick up my dog from my parents house. Plus, I had to get channel locks. I've finished replacing the shocks. The front is waaaay easier than the rear. Don't do what I did and remove the bottom bolt first. It's more difficult trying to loosen the nut on top this way. 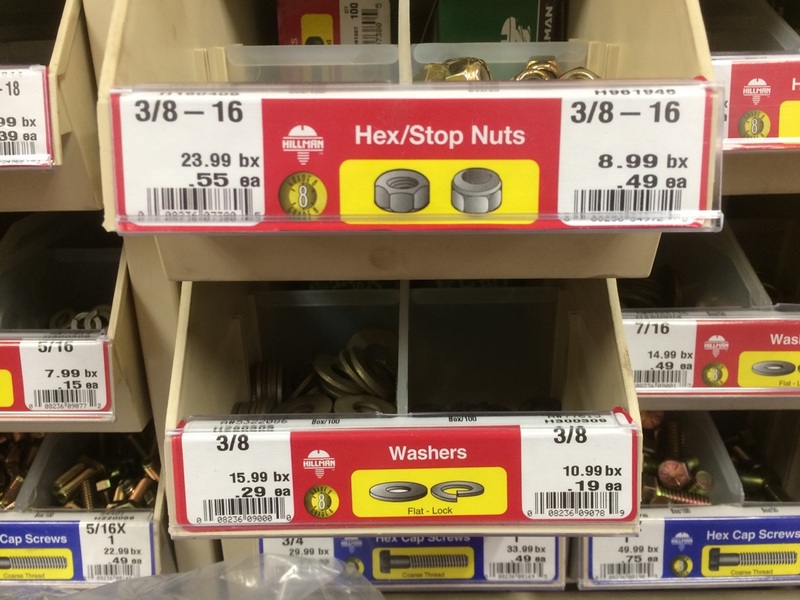 The top nut is a 9/16" and the only way to access it is with a wrench, I suggest getting a ratcheting wrench to avoid lifting up and struggling to reseat the wrench on the nut. It's hard to reach. You can only access it from underneath. I removed the rear tires and placed the stands on the frame. That shot is between the frame roughly between 10 and 11 o'clock position. If you can see the shock post and it's not covered by a shield or rubber boot, Get yourself a set of channel locks. 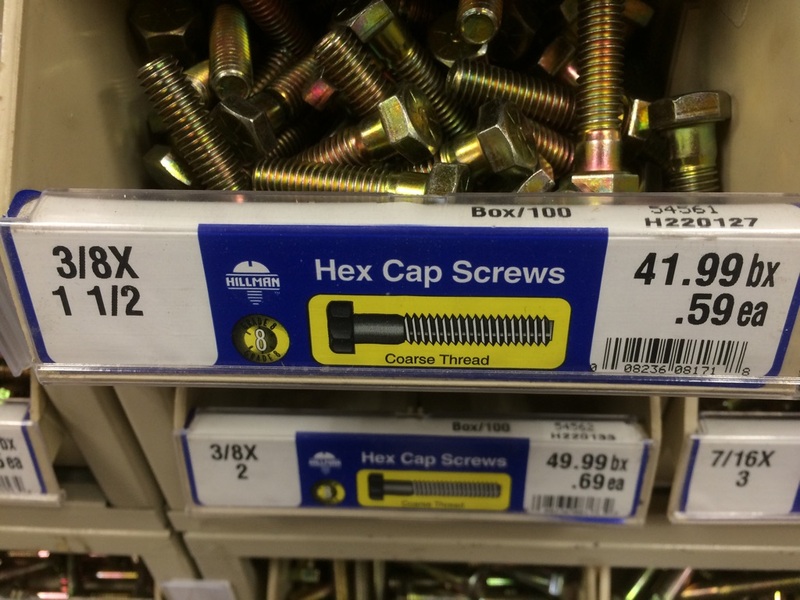 You can grab the post because if you try and loosen the nut on top without that, the post spins. If you can't do that, there's a small ring sometimes it's shaped like a nut like mine were. You can grab it right with your channel locks and loosen the top nut this way. Probably would be easier with two people but, it's not impossible to do it alone. With the bottom nut, mine had this large mushroom thingy on one side and a nut on the back. Since it was rusty, I sawzawed the mushroom thingy off and pushed the shock off. The rear end (differential) dropped so, support the rear end. The part the shock sits on is still in place and can only be removed if you cut it off right against the bracket or figure out how to loosen the nut on the other side. I just cut it and pulled the rusty nut and stud out. Putting the new shock on is much easier. I put the steel plate and bushing on as normal and threaded on the top nut so it would hang there. Mine were slightly shorter than the rear end could extend, so I jacked my rear end up so I could slide the shock on. Tighten it, no need to he-man it. The front was different but much easier. The only difficult part was getting channel locks on to grip the shock from spinning. The top nut is accessible from the engine bay. 9/16" for the top again. I can't remember the size for the bottom. I ended up having to jack the front assembly up so I can fit my channel locks in. Wheel is off for the front too. Just as I was getting the nut free I see out of the corner of my eye, my dog who was chained up in the yard behind me. Curse and go grab my dog from chasing the neighbors cat. Find dog tie out to be I damaged and collar still on his neck. I think he has thumbs. Once the top nut is removed, you can loosen the bolts on the bottom and the shock will drop out. The shock is longer in the front and it caused some issues for me. I had to use my jack to push the shock upwards and carefully line up the holes for the bolt to go into. I again threaded on the top nut so it could hang freely. Tighten everything up and away you go. I found that on the drivers side, removing the air box made access much easier. The KYB monotubes I listed a few posts up are very good. You don't float, it rides very similar to my parents '06 Yukon XL Denali. Thanks for the update man. I'll have to make that upgrade someday. Derp. Here's the parts I used. This is all I got for photos. It was very easy. 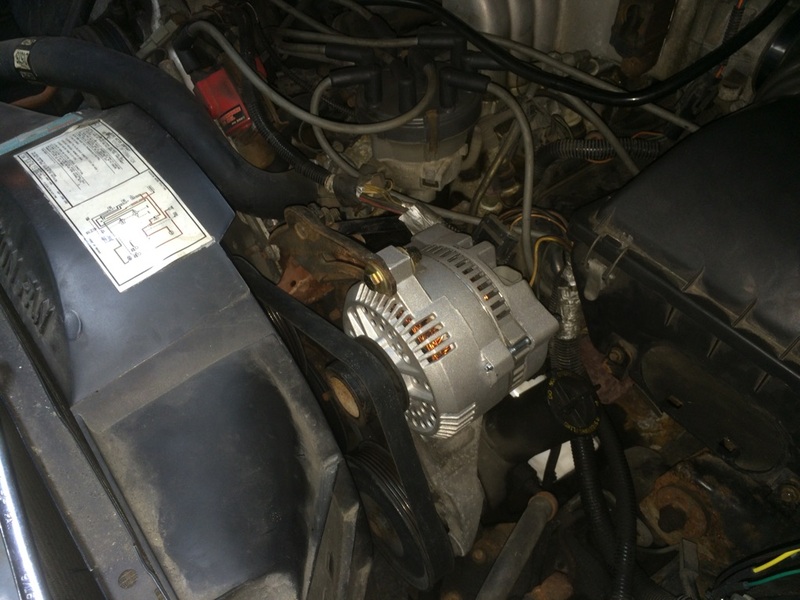 Alternator is a brand new Bosch 130A for a '95 Mustang. 3G conversion kit is from Painless Performance. It came with everything needed though, the charge cable was way shorter to route than planned, probably because it's a mustang kit.... I'll need to get a much longer cable to route it better. The pulley had to be swapped from the old one since the diameter on the new one is a touch too big. It's amazing how much noise the old alternator was making, engine is much more quiet. Also noticed that, while backing up through my long driveway, I will blip the gas and the engine used to stutter like it was going to die out. Apparently that was all alternator drag because that no longer happens. Now I can sit at a stop light with the turn signal on, head lights, and A/C or heat without the lights dimming. So awesome. You'll notice a shiny new bolt on the top ear. That's because the original bolt is way short and would thread into the alternator. The new one's ear is not threaded so off to the hardware store. 1x 3/8" 1 1/2" long bolt, washer on each side and a stop nut (Wut?) went in no problem and worked fantastically. Most 3G conversions I read that you need to cut the alternator bracket. I didn't need to do that with mine. What got me was finding a clean ground for the alternator chassis ground(ground wire was mofo hot because the ground was dirty) and making sure the belt was tight enough since there's no tensioner. You're left cranking the alternator over on the adjustable bracket for as tight as you can make it. First start up I thought the alternator wasn't spinning because there was such a loud belt squeal and the pulley was hot. I'm rather surprised you don't have a spring loaded belt tensioner arm on that thing - Ford introduced that to their 302/5.0 pretty quickly after serpentine belts replaced V-belts. I wouldn't call it a true serpentine system since there's two belts and on right side drives clutch fan, power steering, alternator, crank. The other belt drives A/C, water pump, air pump, and crank. Would the belt not fit with the larger pulley on the alternator? If it does, I would use the larger pulley. Belt squeal is just making heat and noise, of course that pulley got hot. There might be one that will fit right on that setup. Probably from a following year. It's ok now. I could not fit the belt on with the new pulley. No squeal now. I got a buffer for an early birthday present. Naturally, I had to test it on the wagon. The mustang will be next. I have upgraded my wheel well page with all the parts I've installed up to this point with links to where I bought them. Link is in my signature. I hyperlinked the vehicles in read to go to the wheel well page. The only way to watch a movie at the Drive In. on your stomach in blankets. It's probably rotted to one degree or another all the way across the bottom. Common problem on 80s Ford tailgates, they were just poorly designed and people didn't replace the seals they needed to so the process accelerates. Even my Bronco has issues with that, though I do have a rust free tailgate I'll be putting on this winter. The local drive in I was at posted a user submitted photo and guess who's in it?